The Beauceron is a large sheepdog with a commanding presence. They get their name from the La Beauce region surrounding Paris, France. This breed is also known as Berger de Beauce (shepherd of Beauce) and bas rouge (red stockings). Well-muscled and strongly built, the Beauceron is not bulky in any way, but instead presents a balanced and proportioned appearance. He carries his head proudly, and his tail is carried down forming a "J" except when running, when it is carried almost straight out from his body. His most distinctive feature is his hind double dewclaws, forming a pair of independent "thumbs" on his rear legs. They are often mistaken for a mixed breed of Rottweiler and German shepherd parentage. Coat and Colors: Short, coarse, and dense coat no more than 1.5 inches in length; two color combinations of black and tan and harlequin (a mix of gray, black, and tan). Developed solely in France, the Beauceron is the largest French sheepdog, and possibly one of the oldest as well, with possible mentions in historical documents dating as far back as the 1500s. The breed was found throughout France and not just in the Beauce region. Like the long-haired Briard sheepdog, the Beauceron has double dewclaws on the hind leg, showing that they likely came from the same ancestors. The Beauceron has long served farms in France herding sheep and cattle. During the World Wars, Beaucerons were used by the French army, especially as messengers due to their ability to follow commands. They also were used in mine detection and tracking. They continue to be used as police dogs and in search and rescue. The Beauceron was virtually unknown outside of France until World War II. The French Ministry of Agriculture asked the Society Central Canine to write a confirmation examination in the 1960s to ensure the qualities of the breed were preserved. There was concern that with modernization, the breed would die out or be diluted. The breed was fully inducted into the American Kennel Club's Herding Group in 2007 and first appeared at the Westminster Kennel Club Dog Show in 2008. The short, double coat needs only minimal grooming. Brush your dog regularly and give him a bath every three or four months. You will see the most shedding in the spring and fall and just a little the rest of the year. Be sure to trim your dog's nails about once a month to keep them tidy and prevent painful splitting. Don't forget those hind double dewclaws. Be sure to help your dog with oral hygiene by brushing his teeth at least a couple times each week. The Beauceron likes to mouth things, so have plenty of durable chew toys available. By temperament, the Beauceron is watchful, loyal, energetic, and protective without aggression. An intelligent dog, the Beauceron is often described by owners as an independent thinking dog. He is highly trainable and can put his energy to good use in dog sports and obedience competition. Courageous but cautious, the Beauceron should be approachable, but not overly eager to make new friends, instead reserving judgment and holding strangers at arm's length. He is a tolerant dog with children, affectionate with his family, and protective of his flock, both human and animal. Shyness or undue aggression are not acceptable in this breed. You should socialize your dog from a young age to expose him to a variety of situations. Having a Beauceron isn't just a commitment to having a dog in your home, it's a commitment to allowing somebody to follow you around all day, so close that you trip if you turn around too fast, slip into the bathroom behind you before you can shut the door, and take over a large portion of the bed if you let him. In short, you agree to acquire a shadow along with all the other responsibilities of a dog. The desire of a herding dog to keep his "flock" together, be it children, the neighborhood cats, or sheep, often times frustrates the owner, but it is what they were bred for. The drive to work in these dogs is strong and they need to be given a job to do in order to be at peace with themselves. Like many dogs, herding breeds can be destructive and irritating when bored. Lots of exercise is the key to a happy and healthy herder. Take your dog running, cycling, and hiking. Walk him on a leash as he may be aggressive towards other dogs and try to herd other people passing by. A Beauceron can be a good family dog for people with older children who can respect the animal and tolerate the natural herding behavior. Be aware that this can include nipping a child and be sure your kids and any visitors understand this. While any dog breed can develop health problems, responsible breeders take care to maintain the highest breed standards as established by kennel clubs, like the American Kennel Club. Dogs bred by these standards are less likely to inherit health conditions. However, some hereditary health problems can occur in the breed. Allow access to fresh, clean water and feed your Beauceron up to 2.5 cups per day of dry dog food, split into two meals. The amount will vary depending on your dog's size, age, activity level, and other factors. This breed may be prone to gastric dilation and bloat if the dog gulps his food or eats too fast. If the stomach becomes twisted, it can cut off the blood supply and result in a medical emergency. Monitor your dog's weight and discuss nutritional needs with your veterinarian so your dog doesn't become overweight, as this can increase his health risks and shorten his lifespan. Before you decide whether the Beauceron is the right dog for you, do plenty of research. 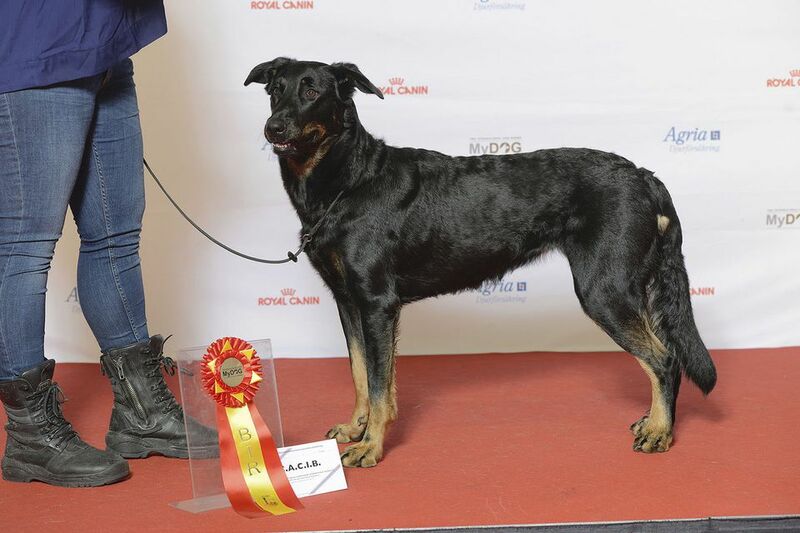 Talk to other Beauceron owners, reputable breeders, and rescue groups to learn more.